SMD Coil – What is SMD Coil, What are different types of SMD coils or inductor. 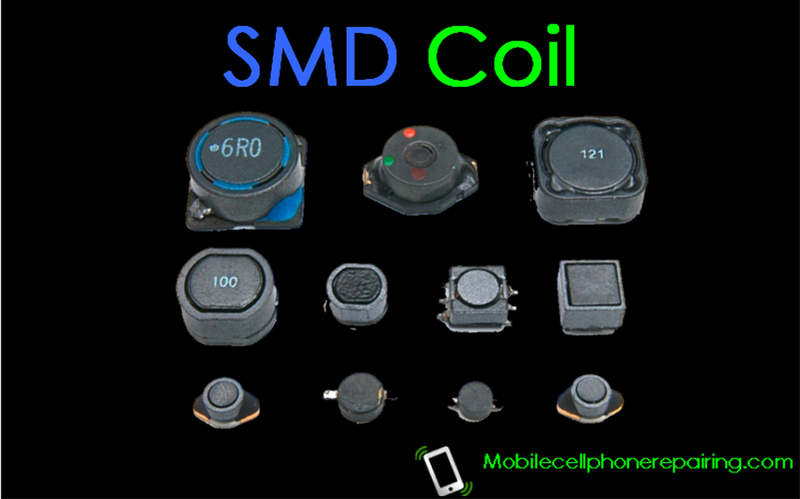 Which type of SMD Coil is used in mobile phones. Learn everything about SMD coils. What is SMD Coil and How is it Made? SMD Chip Coil is made by twisting any conductor wire on a bad conductor base. The base on which the coil is formed is called core. When these coils do not have any base, they are called air core coil. Coil is also known as inductor. A coil always resists any variation in flow of current. If any variable supply is given to any coil, the voltage of opposite polarity is generated in the coil. This property of a coil is known as inductance. Hence, a coil is also called inductor. There are many types of coil but surface mount coils are mostly used in mobile phones. These are tiny chip inductors directly soldered on the PCB track on the mobile cell phone. This type of inductor is called general purpose inductor. This is used for sharp frequency response for high quality factor. These inductors are made by spiraling wire on ferrite core with magnetic shield and surface mounting terminals are created on both ends after mounting it in a small hard package. These terminals are nickel coated for easy and better soldering on PCB Track. Nickel coating ensures reliable soldering. What is the Graphical Symbol of Coil? Which character or alphabet indicates a Coil? What is the Work of a Coil? The main function of a Coil is to STOP AC and PASS DC. What is the Unit of Coil? The Unit of Coil is Henry. A Coil passes DC Current like an ordinary wire. Magnetic properties are generated in the coil on getting DC. The power in the coil attracts iron particles. When AC current or Alternate Current or Variable Electric Current is given to a coil, a variable magnetic electric field is generated in the coil. AC voltage in opposite directions is generated due to this variable magnetic field which resists the AC volt. Place the selector knob of the Multimeter on Diode Sign. Now place the probes on both the terminals of the coil. If a beep sound is produced and the display reads close to 000, it means that the coil is OK. If the display shows 1, it means the coil is open or faulty. Hi pls I will like to have a personal chat with the owner of this site. How to find a coil in mobile phone. Both coil and resistor are looking same. Both colour is black.